This is a wonderful tutorial and written by someone who not only has the most exceptional packaging ideas but who is also the Queen of Funnel Swirls... Thank you so much to Corrie. Enjoy!! 1. Set up your mould, fully lined. You will need to rig up a device to hold your funnel in place. Mine is 4 chopsticks tied together with bag ties! 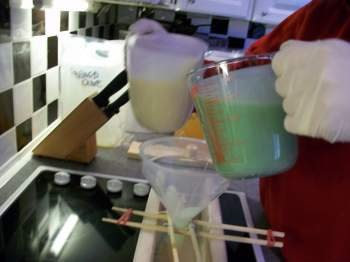 So long as it doesn't fall over whilst pouring, anything will do. 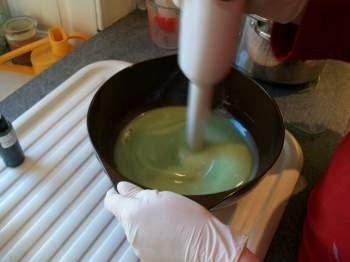 For this technique I find that soaping cool to cold gives you the time to separate, colour & fragrance your batch. You can always put it on the radiator once you're done to kick start the gel. 2. Make up your soap base as normal. Stickblend enough to combine your oils & lye. You want thin trace not thick! 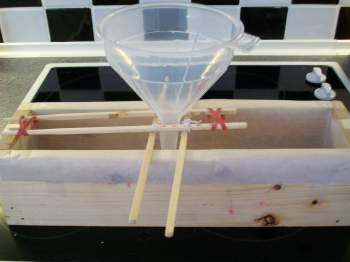 (If it's too thick it won't flow through the funnel). 3. 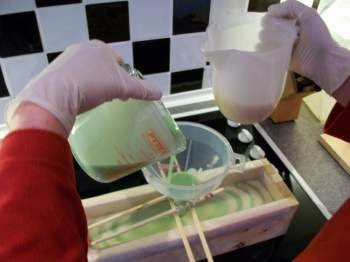 Split your soap batter into 2 halves, colour & fragrance each one. 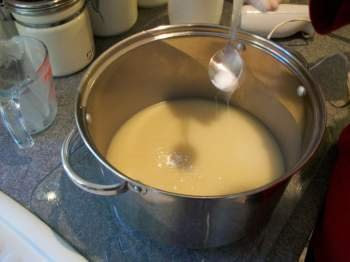 Again, only stir enough to combine the additives well. You do not want a thick batter. If you are adventurous you could try 3 or 4 colours.In the pic below I'm adding Titanium Dioxide powder to this half. In the next I'm adding a green colour to the other half. 4. 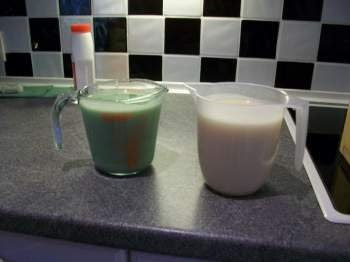 Ok, so now you've got 2 pots of coloured batter. Pour those into 2 jugs ready for pouring. Don't hang around whilst doing this. Have everything ready before you start. 5. Start pouring first one colour, into the funnel, then the other. The amount you pour of each colour will affect the final look, it's trial and error in this part. The pic below shows the mould about half full, you can see how the swirls are building up. 6. 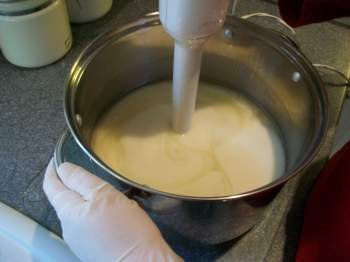 Pour till all your batter is used up. And you're finished! The one I made above is called "Yo! Limey" and turned out like this...It's fun, no 2 bars look the same. For those like me who are swirly challenged, give it a try! Great!!! Thanks for this post!!!! Those looks totally cool!! definetly going to make this!! What fun! I think even a beginner like me could make this. Thanks. 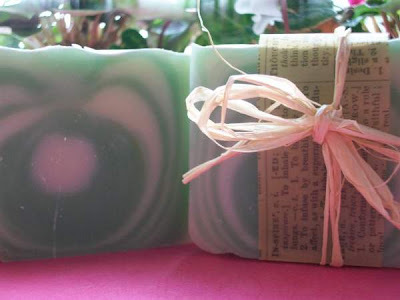 Beautiful soap and great tutorial. 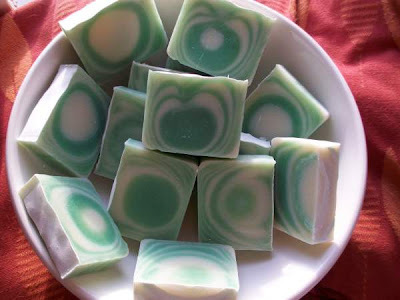 We tried it this week and the soap has a very cool effect when cut. Thank you for sharing. Great job! I'll have to try this one of these days. Awesome tutorial. I'll have to try that soon. I try this with melt & pour soap but I think I do something wrong. The colors mix together and I end with a purple color soap! I think that I should have wait a little between colors so they don't mix that way. please help me, I really like these type of soap !! Ótimo tutorial com lindas fotos. Very cool! I just made one myself.. Orange & Spice... So far in the mold it looks amazing.I'm pretty new at soap making too!